Soft pinks paint the evening sky during sunset as a pod of Orcas leisurely swim through Weynton Passage. The area of Northern Vancouver Island is a prime destination to see not only orcas but also a beautiful sunset on a fine late summer evening. This serene pod of Orcas were making their way towards Queen Charlotte Strait at sunset, just as a fishing vessel appeared from Blackfish Sound. At that point the sunset light was stunning as the coastal landscape and sky above turned several shades of pink and mauve. It was a brief show of light at sunset but the setting was perfect with the scenery, and Orcas. 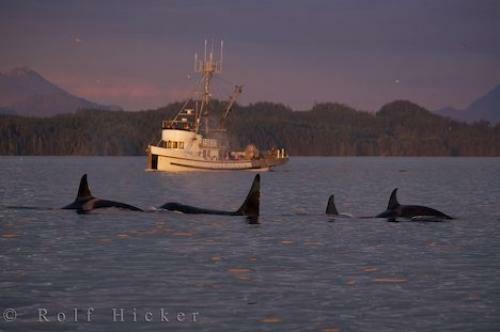 Photo of a pod of Orcas crossing the bow of a fishing vessel during a beautiful sunset in Blackfish Sound, BC, Canada.